FORT HOOD, Texas - 1st Sgt. Scott Dawson has spent several Christmases overseas during four deployments to Iraq, but he arrived home for this holiday Saturday  and he and his family hope it's for good. Dawson was among the very last U.S. combat soldiers to leave Iraq a week ago. Members of his brigade having been arriving Fort Hood in Texas over the past week, and he was in a group of nearly 200 that landed Saturday. Only about a dozen are still overseas, along with members of another brigade that was in the final convoy to cross the border into Kuwait. The soldiers' families waited for two hours in drizzling rain and chilling wind on Christmas Eve morning, some wrapped in blankets and holding signs decorated with ornaments and candy canes. They screamed upon seeing the troops from the 3rd Brigade, 1st Cavalry Division arrive in buses and march onto a field at the Army post. When the announcer yelled "Charge!" at the end of the brief welcome-home ceremony, wives, children and parents ran to the soldiers, hugging and kissing them. Dawson's wife, Capt. Jessica Dawson, said his absence has been difficult even though she may have a better understanding than other spouses. She deployed with her husband in 2009. "He's missed a lot of birthdays and holidays, but you don't dwell on what you missed, and they are little enough that they won't remember he wasn't here," Jessica Dawson said. "The biggest thing is that he made it (back). Like I told the kids, even if he doesn't get back in time, this will be the best Christmas ever because he's out of Iraq." Dawson kissed his wife and scooped up his two young daughters as they ran into his arms. Like many soldiers, he said he just wanted to spend time with his family over the holidays and hadn't made elaborate plans. "It's great ... but it's odd because usually I don't get to stay home for very long," said Dawson, who is staying in the Army and isn't sure if he will be deployed to Afghanistan or somewhere else. The troops slipped out of Iraq a week ago in heavily armored personnel carriers that moved under cover of darkness and in strict secrecy to prevent any final attacks. Dawson said the significance of being among the last to leave hadn't yet sunk in. "In the future I'm sure this will really hit me," he said. Col. Douglas Crissman, the 3rd Brigade's commander, also just returned home and said it was a privilege that the brigade was the last to leave Iraq. Preparing for the final exit took a year, he said. 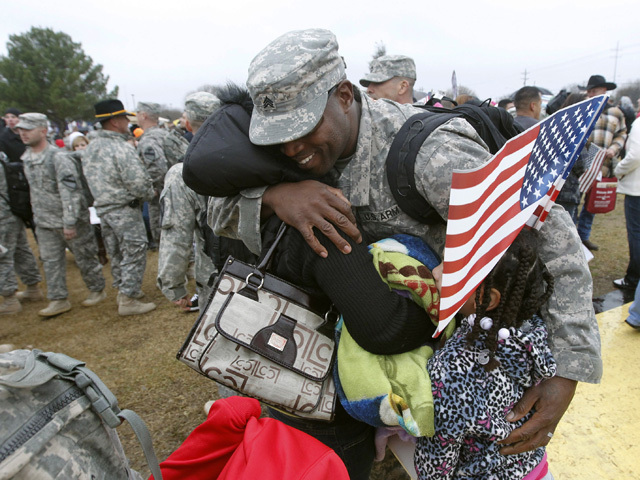 "Fort Hood has given a lot  blood, treasure, time and sacrifice  like many Army installations, so being part of the closing days in Iraq is fitting," he said Saturday as he watched soldiers hug their families. "It's great to be part of the end. There's closure. We were the last vehicles to roll out, and that was a privilege." Fort Hood has about 46,500 active-duty soldiers. Since 2003, more than 565 have been killed in Iraq and Afghanistan, according to officials at the Army post.